La epopeya babilónica Gilgamesh, dice que Khumbaba era el gigante que guardaba la montaña de los cedros: "Enkidu derribó con el hacha uno de los cedros. -¿Quién ha penetrado en el bosque y ha derribado un cedro?, dijo una voz enorme. Los héroes vieron acercarse a Khumbaba. Tenía uñas de león, el cuerpo revestido de ásperas escamas de bronce, en los pies garras de buitre, en la frente los cuernos del toro salvaje, la cola y el órgano de la generación concluían en cabeza de sierpe." The Babylonian epic poem Gilgamesh, says that Khumbaba was the giant that kept the mountain of the cedars: "Enkidu demolished with the axe one of the cedars. - Who has it penetrated in the forest and has it demolished a cedar?, did he/she say an enormous voice. The heroes saw Khumbaba come closer. 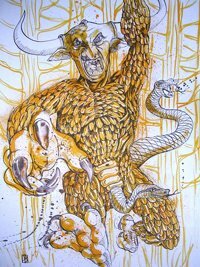 He/she had lion fingernails, the had body of rough brass flakes, in the feet vulture claws, in the forehead the horns of the wild bull, the line and the organ of the generation concluded in serpent head."